Beethoven began composing the Missa solemnis in 1819, when he learned that his patron (and pupil) Archduke Rudolph was going to be appointed Cardinal Archbishop of Olm�tz. The plan was for the mass to be ready for performance at the enthronement celebrations in March 1820, but one year proved to be too little time. It wasn�t until almost three years later, in January 1823, that Beethoven was able to complete the work. As might be expected, it was unparalleled in every respect � although composed for use during church services, even Beethoven�s contemporaries found that it exceeded the bounds of the genre. Beethoven himself was quite aware of both the dimensions and the importance of the work: in a letter he described it as �my greatest work�. It is also a work which over its course encompasses great contrasts: from the solemnity of the Kyrie and the intense excitement at the opening of the Gloria to the disturbing intimations of war during the closing Dona nobis pacem. Originally founded with the aim of performing the choral works of Bach, the Bach Collegium Japan and Masaaki Suzuki are now taking another great leap, after their recent release of Mozart�s Great Mass in C minor. Described as �refreshingly open-hearted, spontaneous and natural� their interpretation received a 2017 Gramophone Award. Joined by an eminent quartet of vocal soloists, the team now applies its expertise in period performance to Beethoven�s masterpiece. Masaaki Suzuki isn�t the first conductor to have made the journey from Bach to Beethoven. Nikolaus Harnoncourt, Philippe Herreweghe, Sir Roger Norrington and Sir John Eliot Gardiner are among those who have graduated from the Baroque (Monteverdi, Sch�tz, Bach) to the late classical and beyond. Such a musical trajectory brings with it huge benefits. Approaching the music of Mozart and Beethoven from the perspective of the Baroque and early classical repertoires brings insight, stylishness, and a well-developed sensitivity to and understanding of where the mature classical style came from. Freed from the stultifying oppression of the late-19th- and early-20th-century Mozart and Beethoven �myths�, their music seems to breathe again, to benefit from the leaner textures, the more natural phrasing, and the more clearly differentiated instrumental sororities. And so it is here in what could well prove a new benchmark account of one of Beethoven�s very greatest masterpieces, the Missa solemnis. Originally conceived for the 1820 enthronement of Beethoven�s patron the Archduke Rudolph as Archbishop of Olm�tz (present-day Olomouc in the Czech Republic), it occupies a unique place in the composer�s output. Beethoven took more than four years to complete it, and it received its eventual premiere not in Olm�tz or Vienna but in an oratorio-style concert performance in St Petersburg. Even then, the Mass�s formidable difficulties and vast scale meant that the performance was delayed from Christmas 1823 to the following April. Considering the considerable challenges it poses for both performers and audiences, the Missa solemnis has been surprisingly well served in the recording studio ever since the days of Toscanini and Klemperer, but it is arguably only with the advent of �period performance� that it has really blossomed. Discs by Gardiner, Herreweghe and, most recently, Harnoncourt (in one of his last recordings) have put the work firmly back where it belongs, at the summit of Beethoven�s creative achievement. 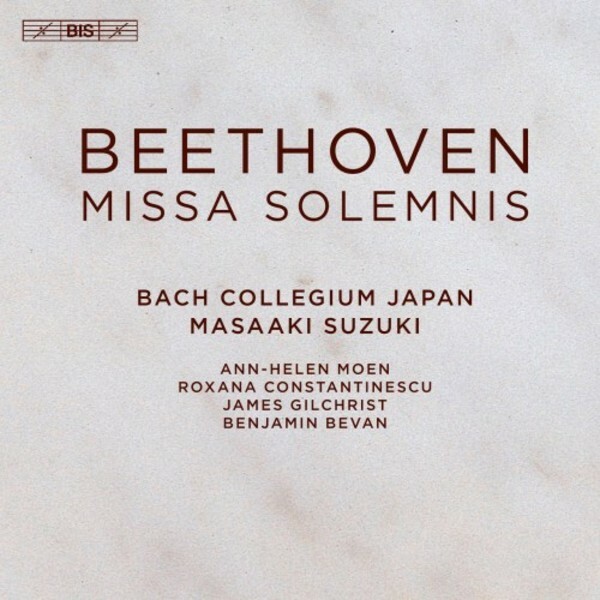 And now Suzuki and his Bach Collegium Japan forces raise the bar still higher in a performance that delivers technical polish and elan, vivid recording and expressive integrity in ideal measure. With richly sinuous strings, pastoral flutes, plangent double reeds, woody clarinets, rasping horns, clear-as-a-bell natural trumpets, narrow-bore trombones that ooze liturgical solemnity, and hair-raising period timpani, all supporting vocal forces of supreme articulacy, this is surely a dream cast. The work�s very opening is marked �Mit Andacht� (with devotion), and it's a feeling that Suzuki brings to the entire work, in a superbly paced and acutely sensitive performance. The sumptuous, immaculately voiced opening chords of the Kyrie immediately recall the mysterious ritual world of Mozart�s Magic Flute, as they were surely intended to do. The expert voices of the 30-odd choir have no apparent difficulty projecting over the orchestra. With the �Christe eleison� we get our first glimpse of a perfectly matched solo quartet: soprano Ann-Helen Moen,mezzo-soprano Roxana Constantinescu, tenor James Gilchrist and baritone Benjamin Bevan. Light-voiced and agile, clear yet expressive, with enough heft for the bigger, quasi-operatic moments, and unwavering intonation, these four singers surpass many star names of the past in this notoriously demanding music. The Mass�s two big episodic movements, the Gloria and the Credo, are quite brilliantly realised and paced, with gloriously transparent textures, thrilling tuttis, and expertly unfolded concluding fugues that build to climaxes of palpable excitement. The sudden contrasts of dynamics and scoring (as at �et sepultus est / Et resurrexit� in the Credo and, later, �Pleni sunt coeli� in the Sanctus) are deftly handled, and you can sense both the connections with earlier musical traditions and just how much Beethoven is stretching those conventions. But it�s in the Sanctus/Benedictus and Agnus Dei/Dona nobis pacem that Suzuki�s performance really scales the heights. Here the singing and playing has such searing intensity and exquisite, unforced tonal sweetness (including a heavenly violin solo in the Benedictus from Ryo Terakado) that even the terrifyingly warlike trumpets and drums in the �Dona nobis� cannot dispel the overwhelming feeling of transcendent benediction. Soloists, choir, orchestra and conductor all play their part in these remarkably intricate and affecting movements. It�s a performance of stellar achievement that remains with the listener long after the disc has stopped spinning, about as close to perfection as one can get in such an inexhaustible masterpiece. For those who appreciate the manifest advantages of �period� performance but crave something less idiosyncratic than the recent Harnoncourt recording, this is now a clear first choice, in demonstration-quality sound, and among the finest achievements of Suzuki and the BCJ to date. Beethoven wanted the Missa solemnis to go �from the heart � to the heart�, and in this performance it does just that. A life-enhancing disc.